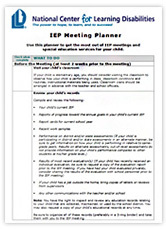 The National Center for Learning Disabilities (NCLD) is providing a free e-book on how parents can prepare for their child’s Individualized Educational PLan (IEP) meeting. 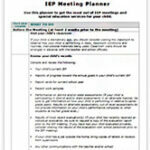 This is a great, free resource for what to do – What do you need to do to prepare before the meeting, during the meeting, and after the meeting. I would also recommend this resource for teachers and school leaders. This will help guide the conversation and create a true partnership and an individualize educational plan for their child! Advocate, participate, aks and support! Remember to send feedback within the 75 days timeline and please pass on this information to others. Please share the following information with people you know maybe interested in sending public comments to the IDEA 2004 Regulations. The document should have appeared in the Federal Register update from 6/21. There will be 75 days for comments beginning with the publication of the regs in the Federal Register. Make your voice be heard!! Information regarding access to the proposed IDEA Regulations is attached. The information will also be posted to the NASDSE web site at www.nasdse.org.